The victory of Our son, Donald Trump, is a Victory for Truth for the Innocent and much more – The enemy will seek vengeance and try to prevent Our son from sitting on the Throne of the Presidency – More protection for you and your family is needed – Son, you may Rule this land with an Iron Rod, but mellowed with Love, Mercy and Compassion – Many trials will still come upon your Nation, so unite God’s children, but you must learn to trust in God. WILLIAM: Jesus then Blessed me and left. Later at home: Our Holy Mother comes as ‘Our Lady of the America’ – as seen by the Seer, Sister Mildred of the United States of America. 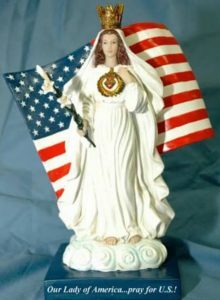 With Our Blessed Mother, is a very large Angel, St. Americanous – the Guardian Angel of the U.S.A. – holding the American Flag. With him is President Lincoln, President Kennedy and President Reagan. Our Holy Mother is flanked by them and many Angels. The White Cross is behind them. “As for you, My Angel of Divine Love, William: Continue on your path that the Eternal Father has placed you upon. I Bless you: In the Name of the Father and of the Son and of the Holy Ghost. Amen.